Background: The bioconversion of renewable terrestrial and marine bioresources and agro-industrial wastes presents a very interesting research and development (R&D) subject to show how high added-value products could be obtained from inexpensive materials, and how this bioconversion could bring solutions to many serious problems like fuel shortage, pollution and waste disposal in a sustainable, yet profitable manner. Objective: Extensive research efforts were, and are being, pursued to develop new products from biomass or to optimize the production procedures of other valuable ones. Method: In this review article, we will present the use of various terrestrial and marine bioresources, by-products and wastes for the production of important and strategic supplies of liquid (bioethanol and biodiesel) and gaseous (biomethane) biofuels, and activated carbons. A special attention will be given to eco-friendly and cost-effective conversion procedures. 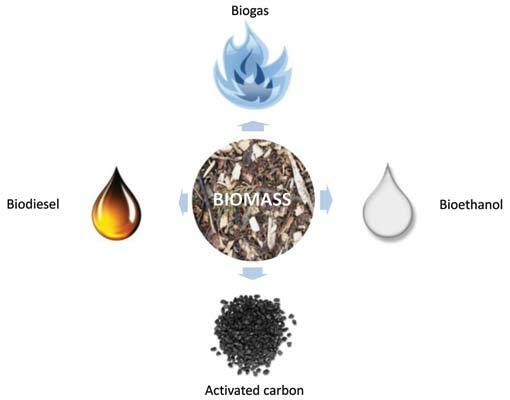 Activated carbons, biofuels, biomass, valorization, wastes.